"Weed control without chemicals" conjures up nightmares of getting down on your hands and knees on a hot day and pulling out stubborn weeds by hand. But suppressing weed growth without compromising your organic principles need not be so primitive. 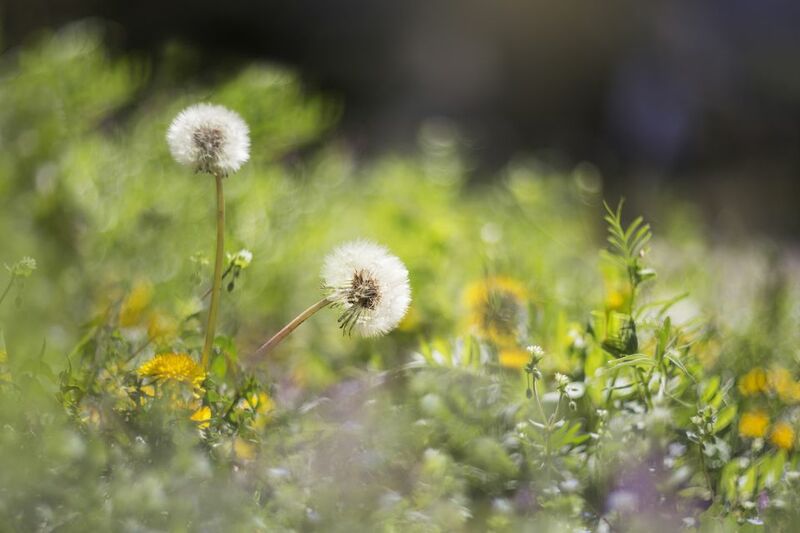 Learn about a variety of measures to use to keep weeds from taking over your vegetable gardens, flower borders, planting beds, and lawn areas. Use these measures in conjunction with each other for best results. Weed removal without resorting to potentially dangerous chemical herbicides can be tough work. Learn how to work smarter, not harder. Kill weeds through soil solarization: Soil solarization is a preventive, organic method of killing weeds before they even sprout. This method is meant for homeowners wishing to start out with a clean slate, re-landscaping a weed-filled patch of land in such a way as to reduce to a minimum the hassle of weed control in the future. Lay landscape fabrics: For those in need of soil solarization, installing landscape fabrics can be considered step #2 in the project of weed control without chemicals. For those with less weedy properties, it is step #1. Weed control without chemicals shouldn't mean going back to the Stone Age, and landscape fabrics are a case in point. These barriers are a hi-tech ally in the battle against weeds. They're not always a good choice, though. Not every gardener loves using them. But if you're a beginner who adores gardening but hates weeding, you owe it to yourself to learn more about them. Experiment with landscape fabrics to see where they work best (and where they present too many drawbacks). They are most effective in shrub beds. Use garden mulch: As the final element in a good foundation for your bed of annuals, perennials, or shrubs, apply garden mulch on top of the landscape fabric. Mulch comes in extremely handy not only when fighting the plants most commonly thought of as "weeds," but also unwanted grass. In fact, there are several different ways to use mulch to get rid of weedy grass. Many people skip right to mulching in their attempts to control weeds organically, but applying landscape fabric first will lengthen the life of your garden mulch, since it won't break down as quickly if it's not allowed to come into direct contact with the soil. Pre-emergent herbicides attack annual weedy plants at the source: their seeds. After seed germination, they act to inhibit the growth of those first roots a weed strikes down. They thus take care of weeds in the soil before they even have a chance to emerge from the ground. Corn gluten is an example of a pre-emergent herbicide used for weed control without chemicals; it's especially helpful in fighting crabgrass (Digitaria). Remember, corn gluten will suppress "good" plants, too, so don't use it in garden spaces or lawns where you're sowing seed. By contrast, you apply post-emergent herbicides only after the weeds have appeared. For weed control without chemicals, try vinegar as a post-emergent weed killer. Even household vinegar is effective if you have only young weeds to deal with in your planting bed (killing older ones requires a special, stronger vinegar). As with corn gluten, be careful using vinegar because it's an equal-opportunity killer: Being a non-selective herbicide, it not only kills weeds but also harms landscape plants that are accidentally exposed to it. Or dilute rubbing alcohol with water to turn it into an herbicide (2 tablespoons of alcohol per 1 quart of water). Spray weed leaves with this mixture. In each case, be careful not to get herbicide on your good plants. Another way to stop weeds naturally is based on the premise that a good offense is the best defense. This is particularly true on lawns. Grass that is well cared for will grow in so thickly that it will largely crowd out weeds. Think of your lawn grass as being in competition with weeds for the building blocks of growth: nutrients, water, sunlight, and growing space. There's only so much of these to go around, and your job is to give your lawn grass an unfair advantage in the competition. If you do so, then you may seldom see a weed in your lawn, especially if you put down corn gluten in the spring to suppress crabgrass. You can take a similar approach to perennial beds. If you're not a big fan of mulch, simply pack your perennials close together, thereby depriving weeds of the bare patches that they so love to exploit. You can also plant compatible ground covers between your flowers. But be vigilant. Weeds and weedy plants can be sneaky. Years after seemingly getting rid of an invasive plant such as sweet autumn clematis vine (Clematis terniflora), seeds that it had deposited into the soil will sprout. Lurking among your perennials, it's easy for it to go undetected and re-establish itself unless you pay careful attention. So, while it's theoretically possible to use the crowding-out strategy in perennial beds, it's not as easy to do so as it is in lawn areas, where weed seedlings are more readily spotted. With landscape fabric and mulch in place, the bad news is that, even then, you may still get weeds. But the good news is that those weeds will be easy to remove. Pulling weeds embedded in garden mulch isn't nearly as difficult as pulling weeds embedded in soil. With that good "foundation" in place, you may not even feel the need to bother with corn gluten and vinegar: Five minutes of easy pulling here and there should get the job done. One exception to this may arise: If the integrity of the landscape fabric has been compromised, weeds may strike down roots in the soil beneath, making them difficult to pull out. In this case, water the area in question beforehand. In fact, a general rule of thumb for weeding is that it's easier to yank out weeds from moist soil than from dry soil.